There’s already a minimised ARM port which looks to bring Rust’s safety features to RTOS/embedded environments and I’ve come across some systems programmers who are interested in Rust, but not noted much momentum. Rust is living in the higher 50 (51-100) of the Tiobe index which is a very approximate guesstimate at momentum, but better than nothing. What this says to me is that despite arriving at 1.0 complete with packaging system and more, Rust is going to have a long journey ahead of it. Back in December, when Node.js and io.js forked, I expressed the hope that it would be a positive fork. Well, now that fork is coming to an end with the reunification, under the umbrella of the Node Foundation. Except there won’t be any merging of code and the io.js repository is being turned into the node.js repository. Io.js folks will join the Node Foundations technical committee and, going forward, the next Node.js will be based on Io.js code. It’s well done to Io.js for taking action and making good practical and solid engineering steps that made it practically a no-brainer to take Node.js forward. We don’t seem to be completely done yet. The structure for future releases and development still needs nailing down. Profanity is a console-based take on XMPP messaging, bridging the gap between IRC and desktop clients. Check it out if you live in terminal windows. Oh-my-git implements one feature of Oh-my-zsh which people really like without needing to switch to Oh-my-zsh or even zsh. It’s a prompt engine which makes your zsh or bash prompt you with details of your current directory in terms of its git status. If it isn’t a git directory, it gives you a normal prompt. Nice work. Want to hear a horror story? Read Knightmare: A DevOps Cautionary Tale and wince at the pain that took a company down in 45 minutes. Yeah, dodgy dossier timing. 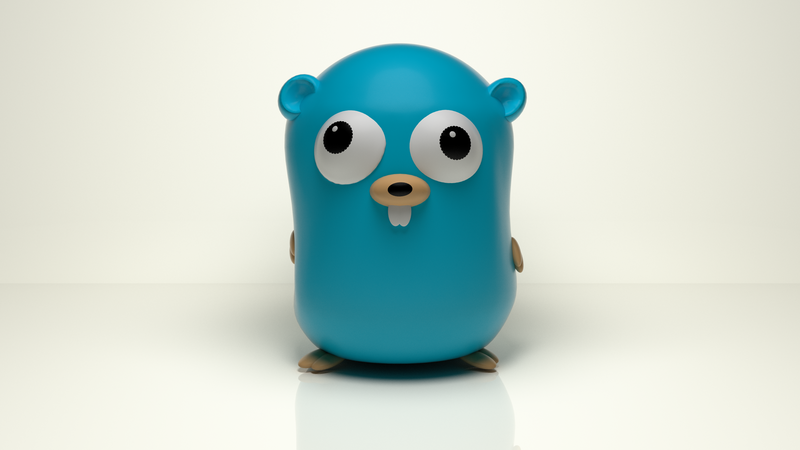 First time using Go? Fogleman knocks it out of the park with his pt project, a path tracer in Go which comes complete with examples. He’s got lots of plans for it too so if rendering 3D things is your thing, you may want to check it out. 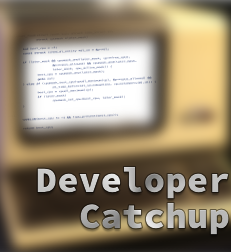 Developer Catchup: Synchronous Node, Serviced Polyfills, Sparks Sparked, Tangrams Mapped and SHAaaaaaa! Node.js synchronously: Node.js is sweet if you can adapt to the asynchronous model of start thing, say what you want to do when its done, do everything else anyway. Good for web request handling but bleh for trying to emulate a shellscript. Turns out that in Node.js 0.12 (coming soon? anyone? Bueller?) we get synchronous child processes to now you can run that curl or find or whatever and just wait till its returned with its results. The folks at Strongloop have written about these synchronous child process methods and how they make writing command line utilities in Node easier. Check it out Noders. Serviced Polyfills: Polyfills fill gaps in browser functionality and standards compliance. The older the browser, the more Polyfill you need to fill the gaps and the newer, the less. But it gets hard working out how much Polyfill you are going to need. Fear not, as Samuel Giles at FT Labs has an answer, “Polyfills as a Service“. Add a simple script tag pointing at a source from the polyfill.io content delivery network to your pages and whatever browser views your page, it gets the polyfill it needs. This is because the system sniffs the browser agent and works out the best set of polyfill based on that. Neat idea, potentially very handy – and you can run your own private version if you need to. Spark sparks: Apache Spark just got a 1.1 release. Spark is Hadoop data processing engine which can run on YARN-based Hadoop clusters or in standalone mode. Spark 1.1 improves the performance (and they already say they are up to 100 times faster than Hadoop MapReduce) and has SQL layer enhancements. 1.1 also adds more statistical functions, can take steaming data fromAmazon Kinesis and pull data from Apache Flume and more. If your into clusters and data crunching and haven’t looked at Spark, you might want to look into it. Tangram Mapping: Do you want to render cool 2D and 3D maps? Check out Tangram, a Mapping Library then as it is building out from a WebGL implementation to other OpenGL platforms to make oodly cool dynamic map renders. Very slick. SHAaaaaaa! : We mention the Google sunsetting of SHA-1 the other week. If you were unsure why this was important, can we send you off to Why Google is Hurrying the Web to Kill SHA-1 which explains why it all and includes a brief history of collision attacks in the wild. Socket.IO 1.0: Socket.IO has hit version 1.0 – the Node.js and browser library which started life as an implementation of the WebSockets interface and has gone on to “become the EventEmitter of the web”. The 1.0 release and changes are broken down in a blog posting, the first on a newly redesigned, and much more useful, Socket.IO website. In brief, modularisation, tighter code, binary support (so you can emit blobs and buffers), automated testing, better scalability using redis, more integration (including PHP support), better debugging support (and silence by default), sleeker APIs and CDN delivery. And the future plans include handling Node.js streams, Socket.IO support in Web Inspector and Firefox Dev Tools and more language and framework support. A splendid tool to have in your arsenal. Git 2.0: The distributed version control system which made distributed version control systems cool before even version control could be cool, Git, has reached version 2.0. In the announcement of the new release, there’s a long list of all the changes and notes on backward compatibility. The 2.0 release has been anticipated by the developers for a while so a lot of ground work had already been done in previous 1.x versions making the 2.0 release look more like a minor release than a major version bump but there’s still plenty of changes and a foundation prepared for future changes. On that subject, there’s a promise of a shorter release cycle for the next release as delays have meant a number of features ‘cooking’ for longer in the ‘next’ branch. OrientDB 1.7: Version 1.7 of the Document/Graph/Sql/NoSQL database OrientDB is available. The announcement for 1.7 notes better perforamnce, new clustering options, support for SSL and sharding, simplified configuration, new SQL commands including parallel queries, plugins for Lucene-based full text searching and more. There’s an Apache 2 licensed community edition of the database and commercially sold and supported professional and enterprise editions. Node-RED updated: The most excellent graphical UI for connecting the Internet of Things (or just things in general), Node-RED has been updated to version 0.6. The announcement notes the process of separating the admin and server authentication to make deployment more robust has begun. Node-RED has nodes that accept HTTP connections and has a HTTP admin front end and previously these were all under one HTTP authentication mechanism – now the UI and nodes are more separate with the option to set a user/password for each. There’s some UI changes like a search filter for the palette of available nodes and easier flow importing by just dragging and dropping JSON onto the UI. In the node-red-nodes library, they’ve added Postgres, Amazon DynamoDB and Emoncms for more connections. There’s also fixes for the MQTT keepalive handing, an added socket timeout settings for TCP sockets and support for all 17 pins of WiringPi. More generally, there’s a range generating node now and the inject node can send empty payloads if needed. Finally, the MongoDB node now can send a user name and password – something I found I needed when writing this for MongoHQ. Hadoop 2.3.0 released: In case you missed it, version 2.3.0 of the Apache Hadoop project got a release. The release notes list all the details. The short version is this is mostly about HDFS, the distributed file system and the changes include the ability to class the storage under HDFS so you can make tradeoffs between say spinning media, SSDs and memory, an ability to explicitly cache files or directories under HDFS (and local zero-copy reading from the cache) and the use of HDFS and YARN to simplify deploying MapReduce code. Hortonworks has a good writeup which also looks forward to Hadoop 2.4.0 with HDFS ACLs and rolling upgrades. NetBeans 8 gets an RC: The NetBeans IDE has hit release candidate for 8.0. This is the version that will include JDK 8 support in the editor, Java SE Embedded and Java ME Embedded support, PrimeFaces code generators, AngularJS navigation and code completion, PHP 5.5 support and much more. There’s a summary in the announcement, a lot more detail in the New and Noteworthy wiki page and a pencilled in release date of mid-April. Skrollr scrolls in: Recently spotted – Skrollr, a compact parallax scrolling and scrolling animation library for all your Webtml5.0 styled sites including the ability to “scale, skew and rotate the sh** out of any element”.